Avocado oil is available in 2oz or 4oz bottles. To keep our pricing low and to pass along a 15% savings on our 4 oz bottles, we use the same label for both bottles. Regardless of the bottle size, you choose the label indicates 2oz. Our extra virgin avocado oil is of nonpareil quality. Cold pressed from the flesh of ripe avocado’s, the oil is an olive green and exceptionally emollient. 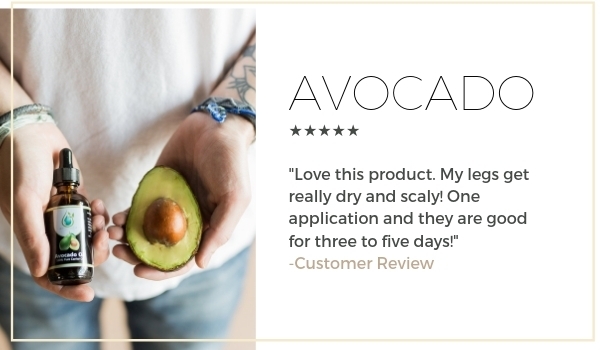 It contains a plethora of vitamins and minerals including copious amounts of Vitamins A, C, and E. Avocado also has the highest protein content of any fruit, making it ideal for undernourished, aging, and lackluster skin and hair. It has a light and soft quality that spreads easily and has a light sunscreen effect. It is also very effective at softening the hair and providing shine. Highly recommended. This is a very thick oil but it does do wonders for moisturizing your dry skin. Add this to my DIY soaps. Love this with soothe in the rollerball! I have never really used carrier oils but received this in my CC package last month and I LOVE IT! I fill my palm with AO and mix a couple of drops of Orange or Lavendar oil to apply over my arms and legs after a shower instead of lotion. This is officially my new favorite carrier oil! Love this product. My legs get really dry and scaly! One application and they are good for three to five days! I love how this oil feels on my skin, with or without another oil! I love the avocado oil! I am going to use it for my and my daughters hair! Its really good for hair and skin! Love it! This oil feels so good on my face!! It makes the perfect carrier oil for any other oils I want to use on my face, and it leaves my skin feeling so soft! It is everything I hoped it would be!! The first thing I noticed was how rich and almost creamy-like this Avocado Oil feels. It is a beautiful green and makes a perfect carrier oil for using on the face, hands, and hair. I love using it at night since it is so high in Vitamin A. Feels rich going on, but not oily in the least. Simply a must-have in the carrier oil category! I am obsessed with avocados, so I knew I had to get this carrier oil! So far, I've mixed a few drops of this oil with the Delight blend and gave a massage. It worked wonderfully and made my hands smell great. I can't wait to try it on my hair as well. This is a very high-quality carrier oil. It's a very thick, moisturizing oil. Great for facial serum blends. I love to use a few drops of avocado oil in my hair after a shower and before styling. Leaves my hair feeling smooth and looking healthy.